» Forum » Game manufacturers » Stern Pinball » Stern LOTR vault??? There are 181 posts in this topic. You are on page 1 of 4. Stern please vault LOTR. I would like to buy one. So I bought a HUO one and have enjoyed playing it. Go find one. Don’t wait for Stern. After TRON, this makes the most sense. It's a matter of when, not if. Anything is possible but when I toured Stern this year I asked about a remake on LOTR and they said the license has expired so its doubtful they would pay on it again after running that game 4-5 times already. Would be great though Especially if they had Frenchy redo the entire art package! 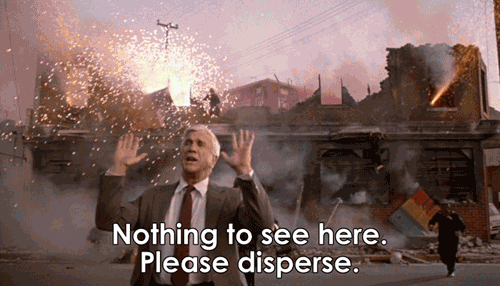 Stern will misdirect right up to the time they announce it. It's their way. AC/DC was never getting another run, even though it was already in process, etc. LotR was running on Spike hardware at one point when they were developing Spike, so I think that's a pretty clear indication that they were at least thinking about it. And given all three Hobbit movies flopping, I'm pretty sure they'll have no times re-activating the LotR license, if they haven't already. There are plenty of nice ones out there for less money than a NIB, so why bother. I'm sure JJP also got protection when they bought the Hobbit license so there wouldn't be any other Tolkien machines to compete with. I would love to own one of these, but I'll be honest, I'm waiting for a VE awhile longer myself. The original art is pixelated something terrible, and I want my games to be just as pretty as they are fun. In the meantime, there are plenty of other great games to own. It's on my want list, but not high enough to at this point not to wait for a VE. Redone with Franchi art and hifi sound quality, it would be a seller. IMO, those were the two most lacking in that game, poor sound quality, and pixelated art. Address those two issues and you're making an already great game even better. If they did, that will expire along with the Hobbit license soon. Vireland wasn't claiming it was you opinion. He was pointing out that Stern misdirects when people ask them about future projects. People love to say this kind of thing. But it didn’t stop Stern from doing AC/DC or Star Trek. We all know they’d sell plenty of LOTRs if they did a run. People love this game and used ones are close enough to NIB pricing that it won’t be a huge factor. Maybe, maybe not. JJP would have had limited leverage in that negotiation, just like any other pinball mfr. (we’re not talking big dollars for the rights holders here). Licensing is a potential bar, but no one on Pinside knows what the studio/likeness rights situation is. Well Luci's were selling for well over NIB price, and that was the draw. Although we don't have numbers, it didn't feel like the AC/DC vault was a big seller, was it? Star Trek? It barely made a ripple, and I had completely forgot about it. Given their performance, maybe vaults have jumped the Shark. My real point was why wait, there are nice LOTRs out there if you really want a LOTR, especially if you have to wait a couple of more years for a new license. To me, finding a really nice used example of a machine is more rewarding than a NIB. Anyone can buy a NIB, but finding a low play HUO machine thats 15 years old or more is a real treat. The problem I see is that they will ask current premium pricing for a new run, not pro pricing. 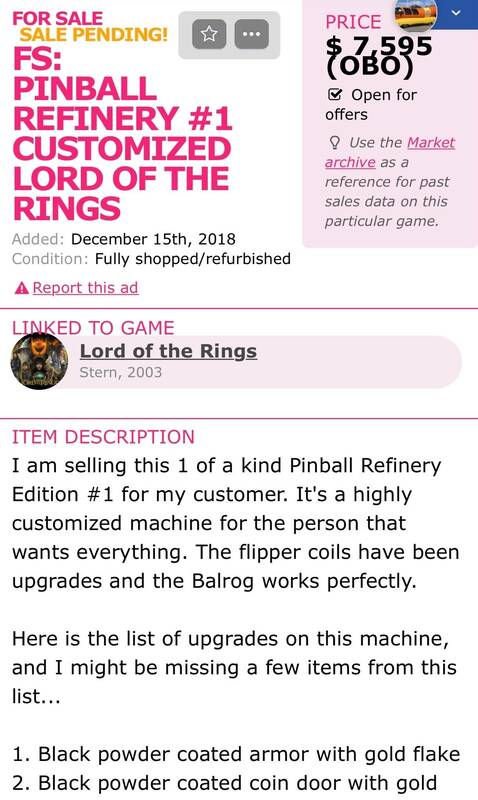 I'm sure some would buy, but I'm not on board with a $7200 LOTR. Understood, but you’re probably not the Vault target audience! There are people that get psyched about potential changes/improvements (print quality and sound quality in this case), and people that just love NIB. If you’re in that camp and can live with not owning an LOTR for a few more years to see what Stern does, there’s no harm in hoping and waiting. I could imagine removing the Path of the Dead, switching to plastic ramps, and upgrading to a cheaper LCD screen as a way to offer Pro prices on a NIB LOTR. The rumor that late-run machines were running on Spike systems also gives credit to the LOTR VE rumors. I would wager that the attraction of releasing a Vault Edition will increase once there are assets available from the new Amazon LOTR TV show and the media hype machine is up and running for it. New art, sounds, characters, actors, etc. That being said, I would be willing to pay $7200 for a NIB Premium LOTR VE! Sign me up, Gary! Vaults are small runs to keep the line going in-between major games. They don't have to make a "big splash" to accomplish their mission. Stern most likely has a set number of how many they are making for each particular vault. I've seen a few AC/DC's out there. Star Trek may have been a smaller vault, but I'm sure Stern sold everyone they made to distros. If Stern made a limited run LOTR with Franchi on the art and updated sound system pinside would be falling over itself to buy them! I’d definitely buy one! As for the Tolkien estate I doubt they would agree to any stipulations that would limit their licensing income. All 3 Hobbit movies are in the top 45 Grossing movies of all time. Oh man that was the era of terrible plastic art so this could be really cool! The LE ran a spike driver board, not a spike cpu board. They might have created a test mule running on a spike cpu but that isn't indicative of anything. Williams did the same with Dr. Dude, it was used for testing the system with a complete game. Adjusted totals are a slippery slope....especially the further back you go. 40 years ago, people only had one way to consume movies; going to the theater. It's been a gradual process of more and more ways to consume a movie; VCR, cable, DVD/Blu-Ray, internet sales, streaming, etc. People consume most movies any way other than going to a theater these days. Revenue is coming from a lot of sources, not just the Box Office gross. Comparing the Hobbit trilogy to the Lord of the Rings trilogy and adjusting is mostly fair, as they are only about 10 years apart. But adjusting Gone with the Wind with The Force Awakens is apples to f@cking oranges. I would go for a Tron vault especially if where in a premium version with LEDs and lighted ramps and perhaps with color LED DMD. I sold my Tron and miss it from time to time. Not enough to track another one down but if it came as a VE - - >> automatic buy. Even on DVD/Streaming, LotR killed Hobbit. By any measure compared to LotR, Hobbit movies flopped. The Tolkien estate has nothing to do with it, and lucky for us, as they would never, ever license a pinball machine (his son absolutely hates the movies and all of the merchandising). But Tolkien sold all film and licensing rights off back in the 60s, and all of the LOTR/Hobbit licensed stuff is working off of that license. New Line in turn got a license from them to make LOTR, presumably including the right to make movie-related merch. So Stern would be negotiating with New Line and/or Middle-earth Enterprises. If they're willing to redo the deal at a reasonable rate, then all is well. Only wrinkle is whether the actors signed away likeness rights to Lionsgate forever, or if Stern would have to go negotiate them individually (which would presumably be a huge pain and probably a deal killer). About 8000 or so units exist. Go buy one. I could imagine removing the Path of the Dead, switching to plastic ramps, and upgrading to a cheaper LCD screen as a way to offer Pro prices on a NIB LOTR. Plastic ramps always make me like a pin less. Metal is so nice. The sound. The feel. I hate plastic ramps. All the games I like with plastics took me a while to warm up to. Re-read what I wrote. I wasn't debating that point. I'm a vault fan. If they actually make an effort to better the game via better art, better display, better sound, then I'm interested. Not to forget the fact of all new components and parts vs 15 year old electronics and plastics. I wouldn't be happy if I paid $5500-6500 for a nice old huo one, and later that year a new VE comes out for $6000-7000. Now that said, ve doesn't always equal better. Acdc in my opinion was better with the drummer, and original lower window. Just my opinion, plus the originals weren't really very old yet. Like I said before, I'd love a lotr ve, but I'm more interested in new titles never before seen. VE games help bring ridiculous high priced huo games back down to earth too. Acdc was a prime example. Who cares? Every game Stern has ever re-made was relatively plentiful compared to the truly-rare games out there like BBB (or 24, for that matter). Supply is entirely meaningless without acknowledging the demand. And demand for LOTR is strong. There are 8,000 of them and it still fetches $5-$6k. Which looks to me like stronger demand than for almost anything other than maybe Addams Family. @srmonte wants a NIB LOTR with improved art and sound, and is apparently willing to pay for it. If there are enough buyers like him then Stern can make money on a remake. I think it's a pretty safe bet that they'd sell enough of this highly regarded game to make it worth their while. I realize that. I was just pointing out that the Hobbit flopped across all formats compared to LotR in case your mention of streaming/DVD gave someone hope. I'd be in just to have it on a platform where the flippers don't turn to mush 1/2 to 3/4 of the way to There and Back Again. Bigger color screen and higher res graphics would be a bonus. They'd sell a lot. I own one of those 8000 units. A very nice HUO game I bought from original owner many years ago with less then 300 plays on it. Now has shaker and LEDS. If Stern would make a Vault with LCD, upgraded sound, and improved art. I would probably end up buying it if the improvements are worth it. Then sell the one I have now. Iron Man truly had a low production run (around 1000)...it didn't become a hit until well after it was out of production. Demand for the game was there, units were not - hence, the Vault. Spidey had a lot out there, but they thought it would do well as a NIB re-skin. When they did LOTR SE, they could barely move them. I think supply is ample for this game based on demand. Anyone who wants a LOTR can find one. That wasn't the case with Iron Man. Play now or wait forever. That's what it comes down to. I don't see Stern re-running a Whitestar game or taking the time/money to convert it into a Spike modern game. I don't see Stern re-running a Whitestar game or taking the time/money to convert it into a Spike modern game. Your limited vision is the issue. LotR Spike Vault is a much more sure bet than Deadpool languishing in the channel. Plenty of pent-up demand for a version that fixes the Whitestar version issues. LOTR is the best game ever IMO. A vault could make it even better. Or not. It’s pretty damn perfect as is, but yes, better sound quality and art would be nice. I never hated the art as much as some. I actually never had a problem with it. I’m 100% against a Spike reskin with an LCD. The dots on LOTR are epic. I'd be down for LOTR vault. I've been waiting for it for years. 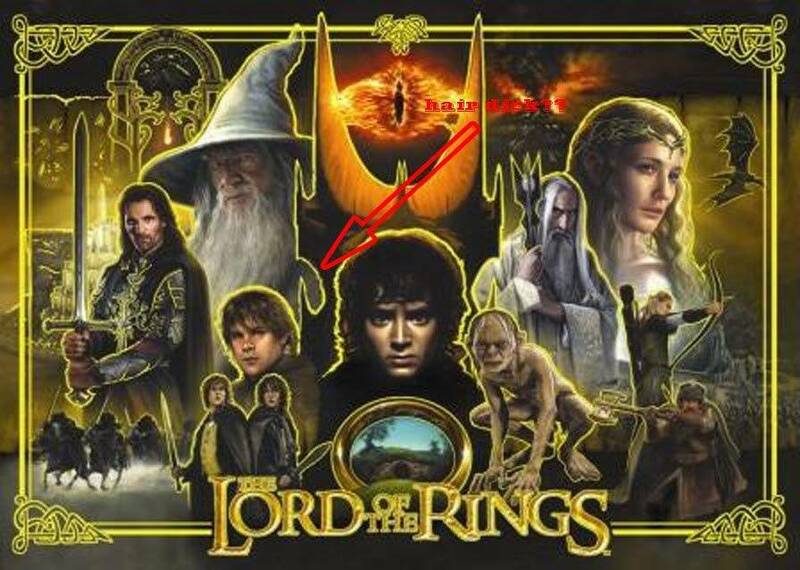 New art would be fine, but I agree the dots on LOTR are epic. Keep the dots. They can upres the dots on Spike with not much compromise. I don't think anyone wants them changed, just improve the resolution and make them color while taking into account the aspect ratio change. See: CGC's very nice hi-res versions of AFM/MB. And having a color screen, no-hassle shaker motor, decent LED lighting (without the mandatory on Whitestar LED-OCD), and flippers that don't go soft on long games would be great, too. Plus Gomez would have something recent to be proud of. He's had a long dry spell, and LotR is one of his least-clunky 21st century designs. Probably his ONLY 21st century one, actually. My vision has nothing to do with it. Pinsiders think typing wishes makes them come true. How many Tron Vault and LOTR Vault posts do there have to be for people to realize Pinball Jesus doesn't answer your Pinside Prayers. You want pinball reality? Go buy the game since it exists already. You want pinball fantasy? Keep wishing for remakes of easy to find mass produced games. flippers that don't go soft on long games would be great, too. 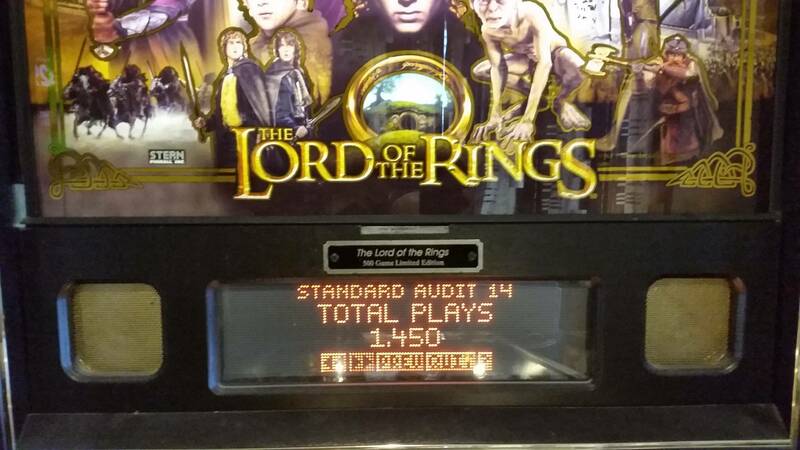 Pinball Life's Special LOTR coils solved this a decade ago. I can play my LOTR for hours and get snappy instant ring shots. To be fair the OP used three question marks which tripled the chances of it happening. One thing you can say about the VE program it’s been pretty much entirely leak-free. These posts are always pointless because if any information was out there you’d already know about it. I really enjoyed the last announcement of Star Trek VE. It actually made people here angry! Hoping the next one is Mustang. Fair enough. But maiden sells like hot cakes. Munsters will sell like hot cakes. Beatles seems to be selling at least as good as regular cakes. To it than just the hotcake factor. Stern has plenty of tasty baked goods in the oven already. Can’t you smell them? I’d buy one if it was something improved lighting and sound.